The story of how same marks can lead to two different grades! It was a sunny day and I felt my car’s AC air gushing at my face. It was in no time, the AC beat the heat but it was temporary. The heat came from a phone call then. The person X of Hive Public School at the other end tells me, “Hari all the overall grade calculation for class 6 is wrong”. I wanted to reassure whether she was telling what I heard, so I told, “Could you please repeat it ma’am?”. “Hari all the overall grade calculation for class 6 is wrong. What we have given in the sheet as aggregation what Report Bee has done doesn’t match at all”. I took deep breath which I don’t do often and claimed, “Your’s is a CBSE school right?”, the answer was ‘Yes’. “We do calculation based on the CCE* guidelines”. And the conversation went on till I agreed to change the grades for deviating students. Now, you would have got it, most of the time we end up abiding customer needs. Usually the assumption for any CBSE school would comply to CCE guidelines. This was an incident on that assumption which proved costly. The next few passages, I will be explaining the math involved in our calculation and why the deviation happened in the first place. So if you are not really a math person and it bores you, feel free to jump to the last paragraph. To your left is the grade calculation image. They say grade is calculated based on the marks scaled up/down to 100, basically percentage. Each grade also has a grade point pinned to it as well. Each subject’s grade for a term is calculated by aggregating the marks procured in the numerator, the total in the denominator and multiplying it by 100. That would give the percentage value for it to be displayed as grade in the report card. In this way individual subjects will have marks and the respective grades. To calculate the overall grade, the individual subject’s grade is the percentage expressed out of total marks in term all subjects inclusive. 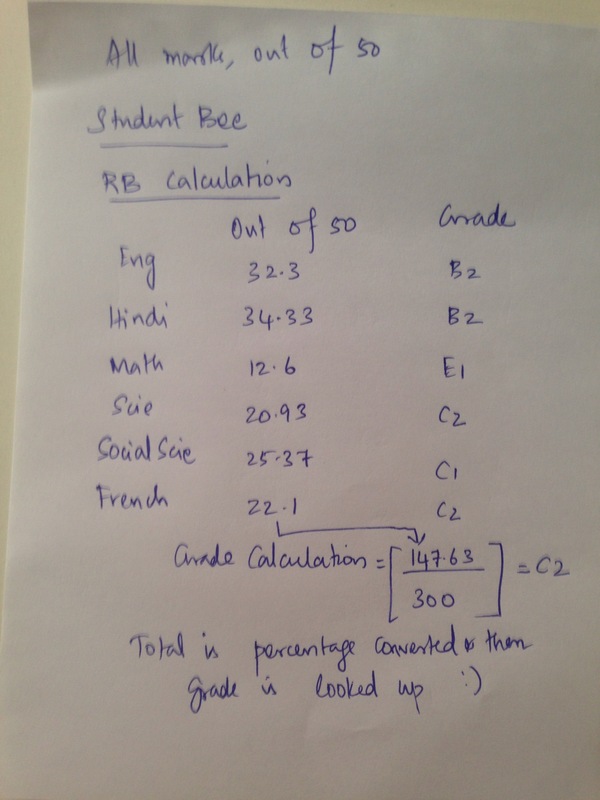 Below is the image explaining our calculation for the specific student Bee. There is no legitimate image for this to be referred. The only place where the calculation can be found out is as fields shared by the school. 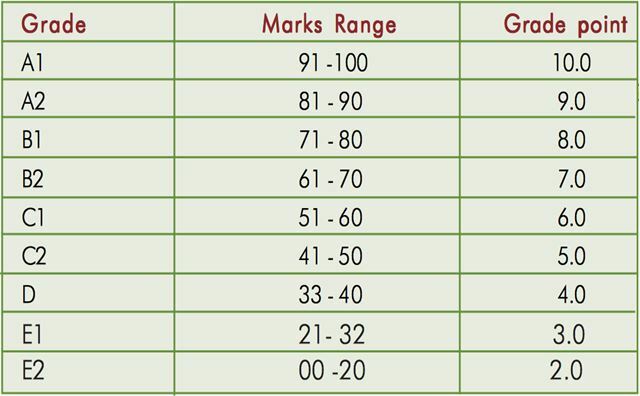 Each subject’s mark is grade with percentage as base. Till this point they resemble our mode of calculation. After this, they do a calculation which you might not see in any CBSE school doing. For the grade procured, the corresponding grade point is referred and this is done for all the subjects. The grade points are summed up and divided by the number of subjects included part of their academics. This gives an average grade point out of 10. The overall grade referred is based on the grade point’s range. Below is the image explaining Hive Public School’s calculation for specific student Bee. 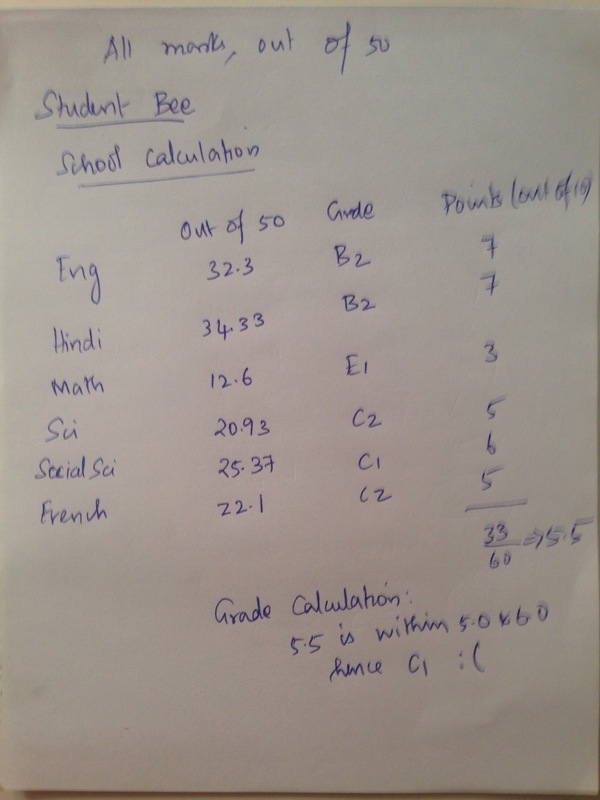 The teachers of the school had gone for a workshop three years back and had brought this take away of overall grade calculation. Had the overall grade calculation methodology been mentioned in the CCE guidelines, this problem wouldn’t have come. So, here we came with a hack. The school identified students with deviating grades and gave it to us. We changed the grades manually through CSS, the tool which is normally used to feast your eyes with vividness. Because of this, there was 956 lines of code at the back end. Also, we ended up editing the grades of 20% of students in a class on an average. *CCE – Continuous and comprehensive evaluation is a process of assessment, mandated by the Right to Education Act, of India. Student’s marks will be replaced by grades which will be evaluated through a series of curricular and extra-curricular evaluations along with academics. The aim is to decrease the workload on the student by means of continuous evaluation by taking number of small tests throughout the year in place of single test at the end of the academic program. Only Grades are awarded to students based on work experience skills, dexterity, innovation, steadiness, teamwork, public speaking, behavior, etc. to evaluate and present an overall measure of the student’s ability. Previous PostNON CREATIVE MEET 6 – THUMB PRINT ARTNext PostBig Data – How ‘Big’ is the data in Education? Thanks Jack! Glad you enjoyed it. Many such small things make it is quite complex to make the right Grade book for students, building a system that can provide flexibility and accommodate myriad idiosyncrasies is an unique value. Thank you for documenting this story Hari.